To know more about this amazing Institute Management System Please go through its presentation here. 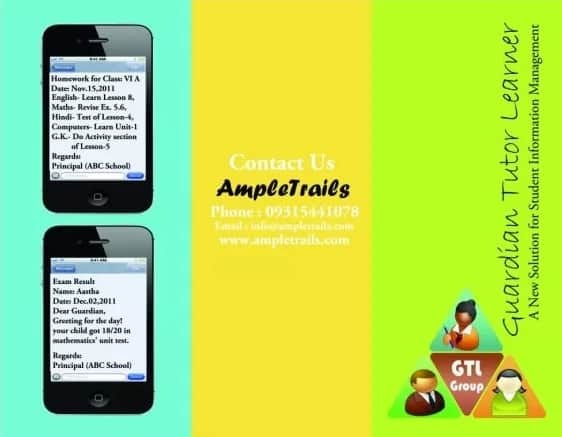 Student Information Management System: Considering the time and distance limitations, AmpleTrails has come up with the new system called GTL Group (Guardian, Tutor an Learners’ group). 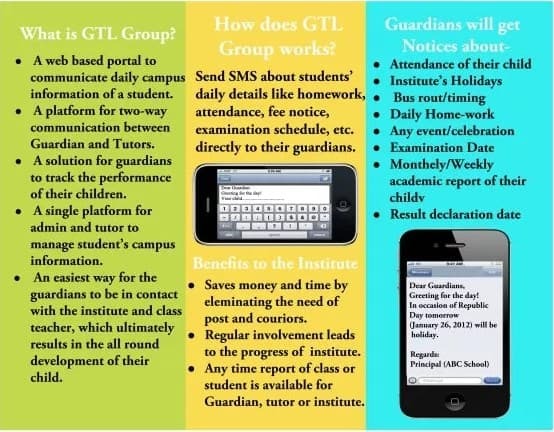 GTL Group is a web based solution to communicate daily campus information of a student to his/her guardian/parents. With the use of this system parents will be in touch with the tutor regarding every activity of their wards. Tutors also have the facility to communicate with parents whenever they want. Parents get notify for each and every achievement. Tutors have no need to write notices in students’ diary for any complaint or reminder. See the presentation of Student Information Management System here. Email us at info@ampletrails.com or call us at 9818390836 for pricing and installation of this machine. CBSE School List India. We have the best Institute Management System. Download the free download and use it till you’re 100% satisfied with it. Free trial version performs all the functions of the paid version. Request for a demo and quote. Institute Management System is also know as College Management System, school management System.